Shearjashub Bourne was an early member of the United States House of Representatives. Years earlier, Bourne was a client of John Adams when Adams learned some life changing news. The American Revolutionaries had declared a boycott on trade with the British, but Shearjashub Bourne had a ship full of oil. Sure, a war was going on, but Bourne had investors whose finances would be in deep trouble if he didn’t sell his wares. The problem was, this oil was supposed to be sold in Britain. In case you thought war and oil working hand in hand was a modern issue…it’s not. Despite being devoted to the Patriot Cause, Bourne decided to use his British papers to sail his ship and fulfill his business duties. Much to his chagrin, Shearjashub was captured off the coast of New Hampshire. The men who took the vessel were American Privateers. Privateers were basically pirates who operated under the authority of a State or Nation, and they kept a large portion of the goods which were taken. Bourne sued to have his cargo returned, claiming that his efforts were in the best interests of his American friends. This case would last eighteen years due to its complicated implication about where the power of maritime courts lay. To plead his case, Bourne hired one of the best lawyers in the new United States: John Adams. This ended up being one of the rare cases that Adams would lose (though, as stated before, it would go through almost two decades of appeals). More interestingly, this seems to have been the last time John Adams practiced law in open court. Shortly after this trial, Adams would sail to France to act as an American Ambassador for the better part of ten years, returning to assume the position of Vice President of the United States. Furthermore, it was while waiting for this trial to begin that John Langdon leaned over the bar and informed Adams that he was chosen to go to France. Adams, for his part, thought Langdon was joking and didn’t realize it was true until several days later when he got home. As for Shearjashub Bourne, during the time between this first trial and the final decision, he spent significant time in the Massachusetts House of Representatives. When the United States Supreme Court heard the appeal, they ruled in favor of Bourne. The decision wasn’t hard, as by this time maritime courts had been firmly established under the jurisdiction of the National Government, making New Hampshire’s initial claims obsolete. Additionally, It would have been difficult to claim him as a Loyalist as Shearjashub was a member of the United States House of Representatives..
Want to read about other Founding Privateers? 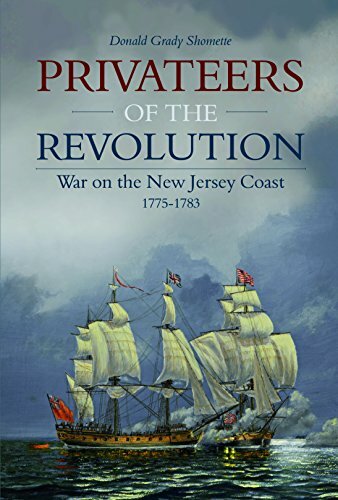 Want to learn more about privateers in the Revolution? ‘War on the New Jersey Coast’ is one of several good books on the subject.